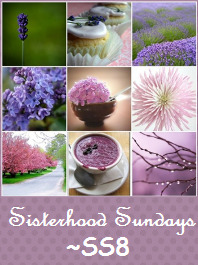 It's time for another Sisterhood Sunday challenge and a chance for you to win one of Rubbernecker's terrific stamps! All of you have to do to play along in our challenge this week is to create a card using your Rubbernecker images and link it to our Stampin' Sisterhood blog for a chance to be randomly drawn as the winner! You can get all the details and see the other designs of my Stampin' Sisters Julia, Jen, Judy, and Kittie there, too! Awwww, aren't all those lovely shades of purple so pretty? I chose to use one of my Wildflower, as well as one of my Weeds, images by Rubbernecker. I stamped the Wildflower twice with Versamark and heat embossed the one on the left with Lilac Pastel embossing powder and the one on the right with PEARLustre Amethyst (I know it looks black in my photo, but it truly is a deep, rich purple). The weed image in the center was heat embossed with Peeled Paint Distress embossing powder. I used a small rectangle Nestability to section off the images, sponging the outer edges with Dusty Concord Distress ink. The sentiment is from Rubbernecker's Friends stamp set, which I cut out with a Fancy Tag die and also sponged with the Dusty Concord ink. I threaded the pretty gingham ribbon through holes at the end of the tag. What a genius play on the inspiration piece! Such a beauty, Ms. Charlene! Love the tile look and the wonderful embossed colors on your stems Charlene! Love the tiles!! The images in the inspiration make me think Spring, but I like the autumnal feel I get from your card - makes me think of crisp autumn days and picking blackberries - with purple stained fingers :D.
What a great take on the challenge, Charlene! I love the mosaic look and the embossing really makes the flowers pop! Gorgeous mosaic, Charlene!! So many wonderful details on this pretty purple card!! You do purple better than anyone I know!! Love the look of this card! So pretty! Beautiful use of inspiration Charlene!